- CHINE – Xigao - Archaeologists said that they have finished the excavation of a 1,500-year-old graveyard which belonged to an aristocratic family during the Northern Dynasties period (386 AD - 581 AD).The graveyard, located in the village of Xigao in Zanhuang County in north China's Hebei Province, was discovered in 2004 when construction workers were clearing ground for the South-to-North Water Diversion Project, said an archaeologist from the Institute of Archaeology under Hebei's Chinese Academy of Social Sciences. The tombs are believed to have belonged to a well-known family surnamed Li. Epitaphs, terracotta figurines, porcelain, bronzeware, ironware and glasswork have been unearthed from the graveyard. Archaeologists believe these discoveries will help them to better understand society as it existed during the period of the Northern Dynasties. - ITALIE – Florence - Des chercheurs italiens vont tenter de retrouver et d'exhumer la dépouille de Lisa Maria Gherardini qui aurait inspiré, selon la thèse traditionnelle, la Joconde de Léonard de Vinci. Une enquête qui s'annonce longue et difficile. Les chercheurs espèrent ainsi déterminer si l'épouse du riche marchand de soie Francesco del Giocondo a effectivement servi de modèle au peintre. Le responsable du projet lancé mardi à Florence, Silvano Vinceti, a précisé que l'exhumation devait débuter fin avril dans le couvent de Sainte-Ursule dans le centre de la ville. Lisa Gherardini est née en 1479. Il y a quelques années, un amateur d'histoire italien avait annoncé avoir découvert un certificat de décès montrant qu'elle était morte le 15 juillet 1542 et qu'elle avait été inhumée au couvent de Sainte-Ursule. Les chercheurs vont suivre la tendance actuelle, c'est-à-dire appliquer les méthodes de la police scientifique à l'histoire de l'art. Le groupe dirigé par Vinceti a déjà reconstruit les visages de certains artistes italiens. L'an dernier, il avait annoncé avoir identifié les restes de Caravage et avoir découvert la cause probable de son décès, 400 ans plus tard. Le projet Mona Lisa va utiliser certaines des techniques de l'enquête Caravage. Les chercheurs vont d'abord utiliser un radar pour tenter de retrouver les tombes dissimulées sous le couvent. Puis, ils devront exhumer les ossements afin d'identifier ceux qui pourraient appartenir à Lisa Gherardini. Ils chercheront par ailleurs des éléments précis, notamment les traces d'une éventuelle maladie. Si de tels ossements sont identifiés, les scientifiques procéderont à une datation au carbone 14 et des analyses ADN seront menées afin de les comparer avec l'empreinte génétique de ses enfants, dont certains ont été enterrés dans une basilique de Florence. Enfin, si des fragments de crâne sont retrouvés, selon leur état de conservation, le groupe tentera de réaliser une reconstitution faciale. Cette étape est cruciale pour déterminer si elle a effectivement servi de modèle pour Mona Lisa et si le célèbre sourire de la Joconde était bien le sien, ou pas. - ROYAUME-UNI – Hastings - WORK on a flood protection scheme has unearthed a 20 metre-long hand-built smugglers cave. 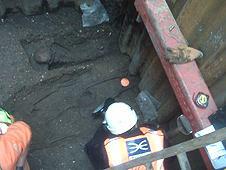 Work was immediately stopped and experts from Archaeology South-East were called in and confirmed the find was likely to be a smugglers’ tunnel built in the early 18th Century and used to smuggle goods such as tea, tobacco, alcohol, silk and sugar - usually to avoid paying duty. And, as well as the tunnel, diggers also uncovered a cannon ball and a piece of pottery from the Middle Iron Age. The tunnel has been interpreted as a previously unrecorded smugglers’ tunnel, which are reasonably common in Hastings, with several being found or mentioned in local folklore throughout the town. There is a large section of these tunnels open to the public at St Clement’s Caves, which are situated around 300 metres to the south of the site. 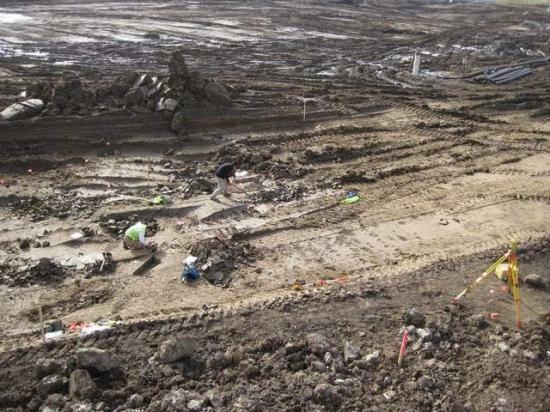 - USA – Des Moines - Sewer construction workers made an unusual discovery on Des Moines' southeast side in January: remains of a human body archeologists believe could be as old as 7,000 years. The remains are thought to be from the Middle Archaic period and were found near a site where scientists believe early Iowans harvested, cooked and consumed clams thousands of years ago. Ancient ash and charcoal remains, apparent signs of a Stone Age clambake, also were uncovered. Studies are ongoing, but it is one of the earliest and best examples of an Archaic site discovered in Iowa. Archaic-period materials have been found across the state, including such artifacts as projectile points more commonly known as arrowheads. But, until the Des Moines site was discovered, few other Iowa archaeological digs have compared in age, complexity and scope- The closest comparison is a site in Cherokee County unearthed in the 1970s. That site included a number of tools as well as a whistle made of bird bone that is believed to be the earliest artifact of its kind in North America. The most common ancient artifacts associated with humans are 1,000 to 3,000 years old, including many of the burial mounds across the state. Other material found at the site includes what appears to be flooring from dwellings that would be about 7,000 years old. Enloe said such a find is exciting because it challenges assumptions that humans from that period were nomadic and rarely stayed long in any place. - FRANCE – Dunkerque - Les archéologues de l'INRAP (Institut national de recherches archéologiques préventives) viennent de commencer des sondages sur le site de l'ancien lycée Benjamin-Morel, dans le centre de Dunkerque. Leur intervention anticipe la construction d'un complexe de logements et de commerces. Elle fait suite à celle menée l'an passé place De-Gaulle, près du théâtre, qui a identifié une occupation humaine au Xe siècle. 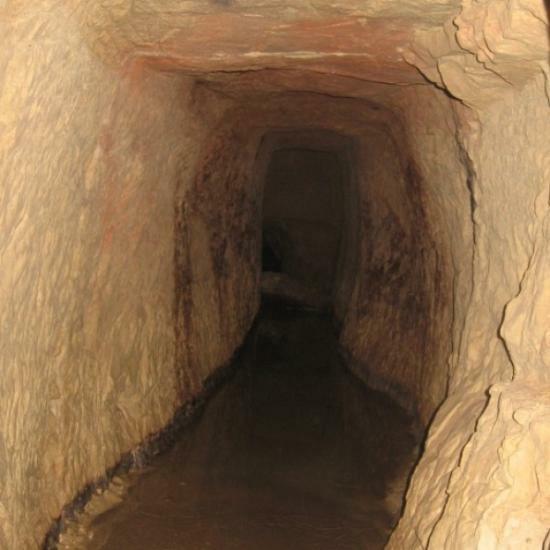 - VIET-NAM – Dong Ngac - A tomb dating to 100BC-200BC was discovered in Ciputra in Ha Noi’s Dong Ngac Commune, Associate Prof Nguyen Lan Cuong, deputy chief of the Vietnamese Association of Archaeology, said. - ROYAUME-UNI - Lincoln - A haul of ancient artefacts including eight skeletons were unveiled when Lincoln College's archaeological dig was opened up for a day. The excavations to date have identified the skeletons as being that of an adult couple, as well as some children, buried in a Christian Roman manner. Allen Archaeology guided onlookers around the site which is shedding light on the history of the place where the college now stands. One of the burials included one with a copper alloy bracelet. There are other Roman period features including pits and ditches which are producing artefacts including coins and pottery. Down-slope from the Roman remains, medieval features are being excavated and recorded. These include a "keyhole" oven along with further ditches and pits. Chris Clay, director of Allen Archaeology, said : "The upper part of the site had the top levels stripped away by modern developments so most of what we found was from the Roman period. "Further down there was deeper soil so we discovered things from the medieval period as well. "We found a cobbled road that could be an early precursor to Monks Road and there were rubbish mounds that held lots of finds from various periods." There may be Roman remains under the medieval features in the southern part of the site and these will largely be protected and preserved underneath the new building. 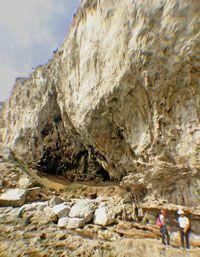 - GIBRALTAR - Gorham’s cave - As part of its drive to establish collaborative projects with researchers and institutions at the highest academic level, the Gibraltar Museum yesterday revealed that it has agreed a medium to long term archaeological project with the School of Archaeology of the University of Oxford. The work will involve all future archaeological excavations at Gorham’s Cave and associated sites within the potential Gorham’s Cave Complex World Heritage Site , a re-evaluation of the Neolithic and Bronze Age of Gibraltar and the other on Mousterian (Neanderthal) stone tool technology from all the caves. - ROYAUME-UNI - Londres - The archaeologists are currently working outside Liverpool Street Station. Here they've found the burial site for the St Bethlehem hospital - which was the world's first and oldest institution to specialise in mental illnesses. There could be hundreds, if not thousands, of skeletons under the road. Slowly with trowels, the archaeologists are uncovering them. The archaeologists have traffic management problems as it sits in the middle of Liverpool Street. They also have to avoid many pipes and cables from the utility companies. It is happening at 20 sites along the route and it has to be completed as part of the planning regulations. Underneath the Astoria nightclub (RIP), they found an old Crosse & Blackwell vault - perfectly sealed with jars still on the shelves.